When one thinks of an art exhibit, with that thought naturally comes an expectation of the sterile gallery walls, the institutionalized, beauracratized, world where creative expression is reserved for the elite few, the indoctrinated, the professional artists. With Taking Art to the Streets, Arts Visalia looks to upset that notion a bit by involving the public directly in the production of the artworks in an exhibition. We are literally going to take the production of the artworks in the exhibition out into the streets so that members of the general public can take part in their creation. In an exciting twist to the traditional exhibition format, Taking Art to the Streets is an exhibition which will grow and transform as the month goes by. Visitors to the exhibition at the beginning of the month will see an entirely different show when they return at the end of the month. New works will be added to the mix while other artworks will have new additions made to them during the show. Stepping beyond the spectator-only format of art exhibits, members of the general public who attend the Taste the Arts Festival will be able to have a hand in creating works of art on display by joining in on a series of participatory art-making activities offered as a part of the festival activities taking place on Saturday, October 19th in downtown Visalia. Through this exhibition and the related activities, we want to illustrate the fact that our art center is here for the public, our exhibitions, our art classes, everything that we do at Arts Visalia, is open and available to the entire community. Led by a talented team of professional artists and art students from local colleges and universities, attendees of the 2013 Taste the Arts Festival, to be held on Saturday, October 19th in downtown Visalia, will be able to take a crash course in a variety of traditional and non-traditional art techniques including block-printing, screen-printing, spray painting, stencil-painting and more. Participants in the activities will be able to create their own artworks or add to a series of large-scale collaborative works, all under the guidance of professional artists. The exhibition will feature works of urban art, block printing and screen printing by the artists of the Urbanist Collective, as well as faculty and students of the College of the Sequoias and the Fresno State University printmaking programs. Artists featured in the exhibition and leading the public during the festival activities include Erik Gonzalez and the artists of the Urbanist Collective, Orlycukui, Shortyfatz, DJ Agana, Reydiem, Matthew Hopson-Walker, Francisco Alonso, Jessica Robles, as well as members of the COS Printworks Club and the Fresno State Print and Glory Club. 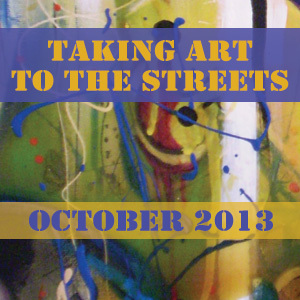 Taking Art to the Streets, the exhibition, will be on display at Arts Visalia October 2nd through October 26th with an opening reception on Friday, October 4th from 6 to 8pm. All workshops and art public art activities will take place as part of the Taste the Arts Festival on Saturday, October 19th from 11am to 6pm at the site of the former Keith Brown Lumber Company property on the corner of Garden and Oak Avenues in downtown Visalia. Admission to all events is free and open to the public. Visit www.artsvisalia.org or www.tastethearts.net for more information on Taking Art to the Streets and the Taste the Arts Festival. Taking Art to the Streets is supported by a grant from the James Irvine Foundation, a private, nonprofit grantmaking foundation dedicated to expanding opportunity for the people of California to participate in a vibrant, successful and inclusive society. The Foundation’s grantmaking focuses on three program areas: Arts, California Democracy and Youth. Since 1937 the Foundation has provided over $1.3 billion in grants to more than 3,500 nonprofit organizations throughout California. With about $1.6 billion in assets, the Foundation made grants of $65 million in 2011 for the people of California.